Want to surprise your friends with extraordinary powers of the true magician, the great and terrible? This is possible if you learn how to do magic tricks. Because the focus is a small miracle. Of course, for a sophisticated and spectacular views takes talent, years of training and expensive props. 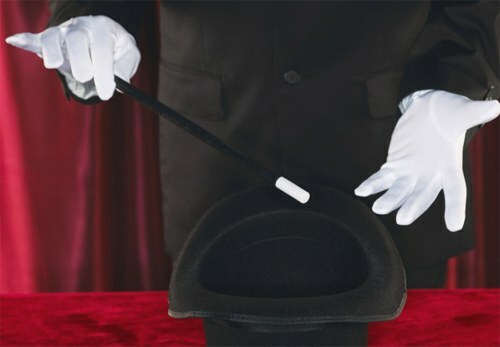 But the simple magic tricks you can learn in a few hours. You just need to have patience and desire. Show your friends a trick, "Manuscripts don't burn"
Write any short phrase with a pen on a sheet of paper. Let me read to the audience written. Then burn the paper and RUB the ash between your hands. Say the magic words, shake hands and show them to the audience. On one hand you will see the phrase that was written on a sheet of paper. Make this focus the pre-writing on the arm with egg white mixed with water at the rate of 1:1 and allow it to dry. When you RUB the ashes from the burnt paper, it will stick to the places on the hand where is written the phrase. In the end, the letters clearly appear on the palm. Surprise your friends focus "the Magic chain"
Prepare an ordinary paper envelope and some coloured paper clips. Show your audience the envelope, give them to make sure that inside the envelope there is nothing. Drop the clips one after the other in the envelope. Close the envelope and seal. Shake the envelope a few times, say the magic words and nadorite envelope. Gently tap the clips out of the envelope. They will be connected in a chain. Make in advance for this focus chain of the same clips, which you then show to the audience. Place the chain into the bottom corner of the envelope and carefully seal this area from the inside. During the presentation of the paper clip throw in the remaining part of the envelope. A torn envelope have taped the angle where the chain of paper clips. Take any thin thread of 10-12 cm in length. Burn it, RUB the ashes with the palms and then shake hands, say the spell and give viewers brand the whole thread. Prepare two identical threads before showing the trick. One thread carefully roll into a ball and hide in the crease between the index and middle fingers of the left hand. After you burn the second thread, RUB the ashes so that the left arm was above the right. Quietly spread the fingers of your left hand and release the hidden thread on the palm of his right hand.